Take-Two's CEO suggests that we could see Duke in other places than videogames, as long as it's the right project. After waiting for such a long time for Duke Nukem Forever to come out, Take-Two isn't planning to give up on the franchise in a hurry. Although the game is receiving a thorough pounding from critics, who have taken issue with its dated design and boorish main character, Take-Two boss Strauss Zelnick says that the publisher plans to do more with Duke in the future. Zelnick wouldn't say anything specific about possible future Duke Nukem projects, but said that they would come. He also suggested that Take-Two would be willing to see the character branch out into other mediums, provided it was the right project. "We don't want to ever be in the position of dumping something down just to make another buck," he said. "If we can take some of our intellectual property and bring it to another medium in an extraordinary high quality way, that delights consumers and represents an interesting commercial opportunity for us, we will." Zelnick also dismissed criticism about Duke Nukem Forever's adult content, saying that he stood behind the media that his company published. He said this stance made it easy for people to be critical of the company, but said that if people had a problem with the game's content, then they shouldn't play it. It's not hard to see why Take-Two wants to wring a little more life out of the franchise: it fronted a lot of money to get Duke Nukem Forever released, and it would undoubtedly get as much of that money back as possible. 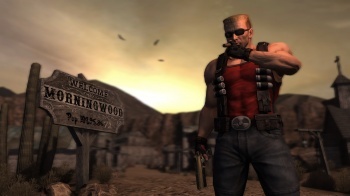 For better or worse, the Duke Nukem franchise has a lot of brand recognition, and a new Duke Nukem game, rather than an old one that just took a long time to come out, could potentially fare a little better with reviewers. Judging by a lot of reviewers comments though, Duke himself is going to need quite a lot of rehabilitation.